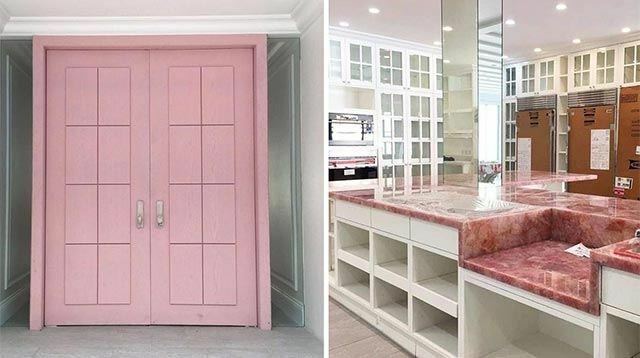 The millennial pink door is TDF. If you've seen the Queen of All Media's former home in Makati, you'd have an idea how colors play a huge part in her space. From deep shades to striking hues—these picks made her home unique and special. While she has settled into a new abode years after moving out of the spacious condo, her love for captivating details remained. According to Kris, her sons agreed to this pink front door. If you're planning a quick makeover that won't cost much money, painting the front door can be on the top of your list. Choosing a lighter shade keeps it cool and pleasing to the eyes, while still making a statement. Work with a color that would catch the attention of your neighbors, while still complementing your interiors. Tip: Curious about pink? Consider working with Millennial Pink! It's a soft beige with a hint of blush that can help open up your space and make it inviting. Click here for ideas. Would you believe that this is only a partial view of the kitchen? It's no secret that Kris enjoys cooking and preparing meals for her kids, family, and friends—a good reason why her cooking area takes up so much space. We're curious as to how the home will look like after turnover as she shared that it won't have a living room, to allot more space for the kitchen. The family will have access to a lanai by the pool— another area perfect for entertaining guests. Notice something special in the kitchen? The rose quartz countertops were a specific request by the owner, and pairing it with white cabinets and compartments makes the material stand out. We're sure Kris would have a grand time whipping up dishes as the kitchen will also have different cooking stations—a teppankayi grill, double ovens, and a high intensity wok cooking spot, to name a few. Tip: Loved Kris' rose quartz countertops? Achieve something similar with Kaufman Stone's Pink Onyx. See more options and find details on how you can order by liking them on Facebook. You can also visit Kaufman Stone's website. With the help of interior designer Rossy Yabut-Rojales and the Heim Interiors team, Kris was able to achieve her concept for Josh and Bimby's bathroom. Locker-inspired and dominated by black tiles and partitions, the spacious T&B highlights a tub, two showers, two toilets, and side-by-side vanity sinks. The chosen details add an industrial feel to the home, a break from the light colors seen in the kitchen. Tip: Looking for quality bath fixtures to add to your space? Visit the Sanitec Main Showroom at #236, E. Rodriguez Sr. Avenue, Barangay Don Manuel, Quezon City for options and setups you can use as pegs. For more ideas on how you can incorporate partitions into your home's aesthetic, click here. A few weeks ago, Kris also shared a quick video update on the status of her home's construction. You can tell that the home will be airy and spacious, given the high ceiling and numerous windows.